Artikinesis had a field trip last Friday to Withymead Nature Reserve near Goring in Oxfordshire. The reserve is a 22 acre site by the Thames, run by a charitable trust, that we visited by prior arrangement. 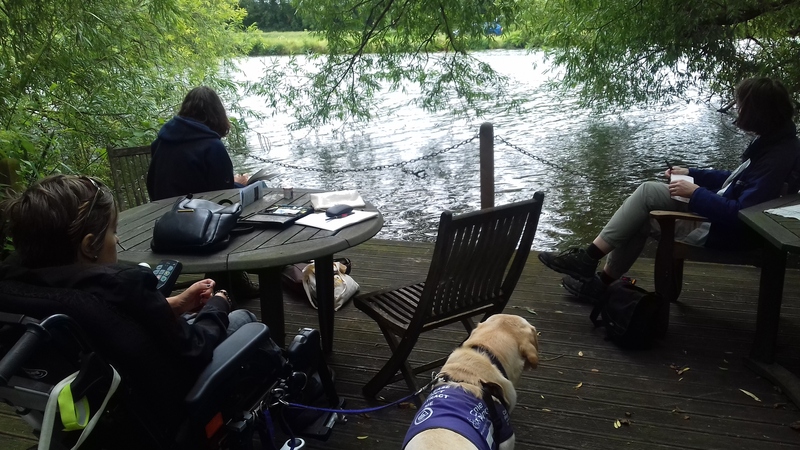 We enjoyed a guided tour of the reserve – including an unexpected, but welcome, close encounter with a resident sparrowhawk (we also sought out slow worms, grass snakes and newts during the course of the day) and, after tea and coffee by the riverside, we set to work in earnest. Adeliza and I were both drawn to the old slipways, part of the former Saunders boatyard, so we set up our easels side by side to make two very different oil paintings. Elinor and Rosemary were lighter equipped and made several sketches in different parts of the reserve.